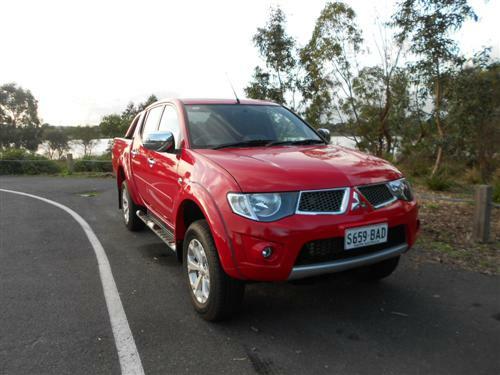 The Mitsubishi Triton is a big seller - one of the best selling vehicles in the nation in fact. There is no secret why. Whilst strictly convention in its approach to hard work, the Triton accommodates many uses in its 'repertoire' because of the vast array of variants and the decades of experiences that has earned the brand a very loyal following be it for work or play. Just quietly, let me add a snippet of news - a new generation Triton comes along next year. In the meantime, the current model still serves buyers quite well. 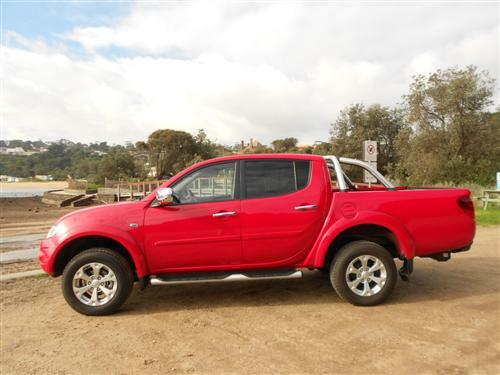 We managed to reacquaint ourselves with the Triton by jumping into the 'saddle' of a GLX-R Double Cab 4x4 ute. This diesel powered top-of-line model was fitted with the optional automatic transmission and this feature has my recommendation. The test car is priced from $48,240*. A manual version is available from $$45,740*. When you're of average height you climb into the Triton, rather than slide in. That's the way it is with these large utes. Once onboard you appreciate the lack of complication. All controls are easy to use and many modern day 'devices' are catered for including a Bluetooth connection. These types of trucks tend to ride a little firm, some are even hard. The Triton is firm in its ride qualities as it compromises between passenger comfort and load hauling potential. 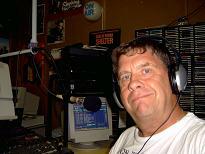 It's a good mix and, no doubt, this arrangement does suit a lot of people. The steering and braking feel a little better than the class average to me. You certainly have excellent vision in all directions in the Triton. Engine performance is good in my opinion although it does feature, as others do, the typical diesel 'clatter'. Unfortunately, the steering wheel adjustment is confined to height movements as no 'reach' adjustment is included. But a user friendly cruise control is included. On this occasion we didn't undertake any off-road adventures. However, the team has been off-road in numerous Tritons over the years and have always been suitable impressed with the truck's capability. Our drive experience was confined to 373 kms around suburban Melbourne. The GLX-R is a popular variant in the Triton range, no doubt because of the good level of standard equipment in this model grade. Standard features include: attractive 17” alloy wheels, Chrome door mirrors with turn indicator and 'fold' control, Wire type tailgate stopper, Chrome exterior door handles, Fog lamps, Privacy glass, Side steps (tube type), Roof mounted radio antenna, Side protection mouldings, Sports bar, Rear step, Honeycomb grille with chrome surround, Tailgate mounted stop lamp and on the inside there is Passenger side vanity mirror, Leather bound steering wheel, Leather bound gearshift knob, Leather bound 4WD transfer-shift lever, Carpet floor covering, Chrome interior door handles, Automatic air conditioning, Ticket holder (driver side sun visor), Map lamps with sunglass pocket, Illuminated ignition key, Rear power window – with an auto up and down function, sports cloth trim (black), Multi function display (includes: clock with date, outside temperature, compass, barometer, altimeter, trip computer with range to empty and average fuel consumption functions, audio information), Speakers (6) and Steering wheel audio controls). Yes, well equipped and from what I can gather this is what people want when their utility truck is more than just a work ute. All Triton 4x4 models come with a diesel engine. It's a 2.5 litre 4-cylinder intercooled turbocharged common rail unit which offers 131kW of power at 4,000rpm and a worthy 350Nm of torque at 2,000rpm (400Nm with manual transmission). The Triton GLX-R auto has a six-speed unit. Triton GLX-R offers the superior 'Super Select 4WD System' that offers full time 4WD with the option of four driving modes. This system also offers on-the-fly shifts from 2WD to 4WD high range. It's disc brakes up the front and drums at the rear. Anti-lock Braking System (ABS) with Electronic Brakeforce Distribution (EBD) is fitted. Five 17" alloy wheels are standard. Standard tyre size for the GLX-R 4x4 Double Cab is 245/65R17 111S RF. Suspension is double wishbone with coil up front together with a front stabiliser. At the rear it is Rigid - elliptic leaf spring set-up. Power assisted rack and pinion steering is fitted. 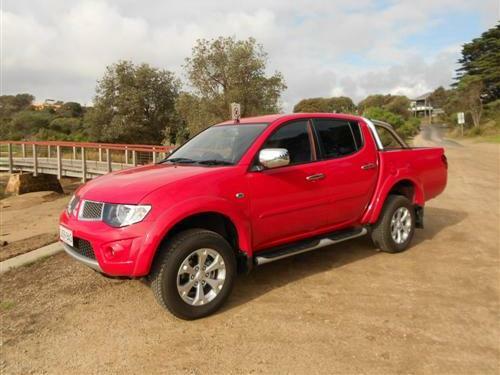 The turning circle is 11.8 metres - a fairly good figure for such a large 4x4 ute. The fuel consumption rating is 9.6 litres per 100 kilometres on the combined cycle for the diesel with automatic transmission. Our average, as per the onboard trip meter, come in at 10.8 litres per 100km. That was OK with me because we undertook suburban running solely. The fuel tank capacity is 75 litres. Triton GLX-R 4x4 comes with Electronic tune AM/FM radio/CD/MP3 player, 6 speakers (includes 2 tweeters), USB Input, iPod control, Multi information display (includes trip computer, outside temperature, average fuel consumption, compass, altimeter, barometer, date, time) and Bluetooth 2.0 phone connectivity & audio streaming with voice control (for compatible devices). 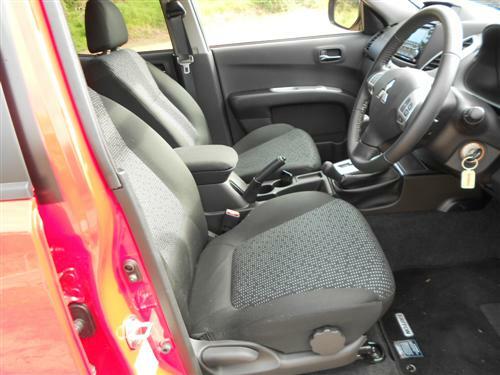 Driver & front passenger SRS airbags, Driver & front passenger side SRS airbags, Curtain SRS airbags are fitted to the double cab GLX-R ute. Active Stability Control (ASC) and Active Traction Control (ATC) is included. No reversing camera is fitted, regrettably. 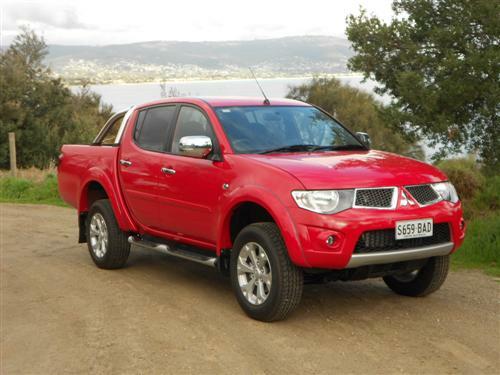 ANCAP rate the crash worthiness of the Triton 4x4 double cab with four stars. Kerb Weight: 1,976 kg (approx). 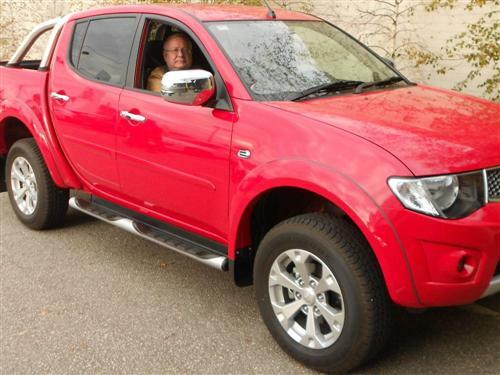 Triton 4x4, with appropriate towing and trailer braking equipment, can haul a huge 3,000kg. Tub liner, utility box, canopy, front protection bar, mud flaps, reversing camera and hard tonneau cover are just some of the wide variety of accessories available. A five year/130,000 kilometre warranty comes with the Triton (conditions apply). Roadside assistance is included for the first year of ownership and this is extended if a Mitsubishi dealer services the ute in accordance with the scheduled service programme (conditions apply). Capped price servicing is a feature with Mitsubishi. It applies up to 4 years (conditions apply). 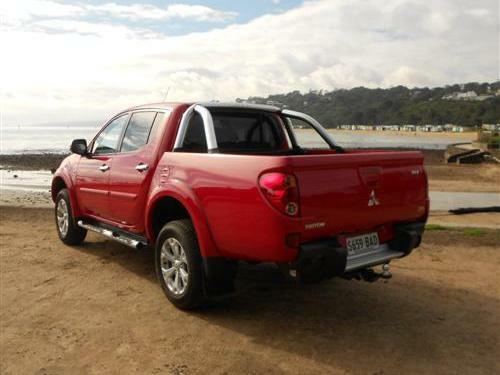 The Mitsubishi Triton is a well respected truck. 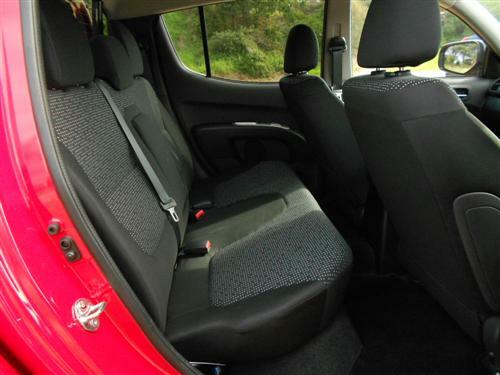 The GLX-R makes the ute appeal to a broad range of users, especially those who include 'family' or recreational purposes. I always enjoy a Triton 4x4 drive - just wish I took it off-road on this occasion. 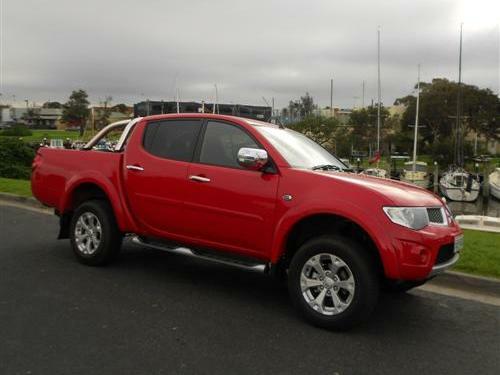 The attractive appearance of the Triton is a bonus and red, like the test car, makes it go as fast as any other colour!